Our Nativ Vita High-Resolution Music Server and Nativ Wave USB DAC are impressive standalone solutions in their own right, and deliver best-in-class performance in their respective product category. However, it is only when you pair them up that you realize their full potential. Nativ Vita and Wave recognize each other automatically and do not require manual and complicated configuration. Unlike a computer Nativ Vita feeds Nativ Wave with High-Resolution Audio and DSD256 without any special drivers or settings. Setup your DAC, control the volume and view interesting information about the audio format on the beautiful 11.6” LCD. Control Nativ Vita and Wave conveniently from your couch via the same smartphone & tablet apps. Try that with a regular PC and USB DAC. All Nativ products use the same beautiful design and premium-grade materials so they are the perfect match. 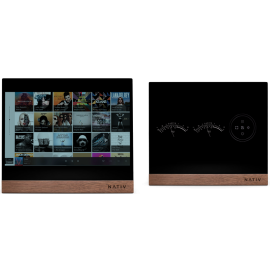 Nativ Vita is a world-class music server and touchscreen control center. Enjoy instant access to all your music, from your favorite music services—such as Apple Music, Spotify and Tidal—to music on your computer, NAS or smartphone. Delivered in bit-perfect quality to your wireless speakers, USB DAC or A/V receiver. Conveniently control your music and wireless speakers. The beautiful high-resolution LCD with IPS technology delivers a stunning picture, from any viewing angle. High-quality digital outputs: asynchronous USB 2.0, SPDIF (RCA, TosLink, BNC) and AES/EBU (XLR). Supports up to DSD256, DXD and 32-bit/384kHz PCM. Features WiFi 802.11ac, Gigabit Ethernet and Bluetooth with aptX®. Supports Apple AirPlay, Spotify Connect and Google Cast. Built-in support for Apple Music, Spotify, YouTube, Pandora and other services, plus 40,000 internet radio stations. Play music from your PC/Mac/NAS or smartphone. Enjoy breathtaking music in every room of your home. The Vita supports all major wireless speaker brands, including SONOS, Denon HEOS, Bose and B&O. Store your music on the built-in Hard Disk Drives for ultra-fast access. Two drives of up to 5TB hold 40,000 albums or 200,000 HD tracks. Available with SSD drives. Connect any audio source such as CD Player, game console or TV to the analog or digital inputs and stream audio throughout your home. Designed to play well with your USB DAC, wireless speakers and network player. Powered by an open platform for developers to build great apps & features. Browse the music on your Mac, PC or NAS with the stunning 11.6” LCD and Roon’s innovative interface, and play on Nativ Vita in perfect quality (requires Roon software). Connect Nativ Vita via HDMI or wirelessly via Google Cast and enjoy the stunning interface and the latest music videos on the big screen. Download our free iOS or Android apps to your smartphone to control Nativ Vita from anywhere within your home. The centerpiece of Nativ Vita is a beautiful high-resolution 11.6” touchscreen LCD with IPS technology. Compared to solutions that rely strictly on apps Nativ Vita is a lot faster, more convenient, and won’t be interrupted by phone calls or notifications. Music is everywhere today, and Nativ Vita puts it all at your fingertips. 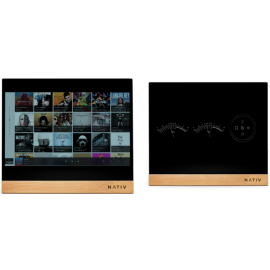 Nativ Vita supports a wide variety of streaming services such as Apple Music, Spotify, Pandora, Deezer and Tidal*, directly on the built-in LCD. Nativ Vita plays music stored on your computer, NAS or USB Hard Disk Drive and supports all major protocols including UPnP/DLNA and direct playback via SMB/CIFS. Access your music and playlists directly from music software programs such as JRiver, KODI or Plex. We are also working on support for the popular new Roon Labs software, so you can use Nativ Vita as a streaming endpoint. Many of us use a smartphone as music source. Nativ Vita features the latest Bluetooth technology with aptX® and supports Apple AirPlay, Spotify Connect and Google Cast so you can access and play this music with ease, and in amazing quality. Radio from around the world. Pick from a selection of over 40,000 free internet stations in over 120 countries and 50 genres. Plus podcasts. Music is more than just sound. Google Play Music, Spotify and Tidal are now delivering music videos as part of their service. Nativ Vita supports them all, plus YouTube. Simply create a playlist with your favorite music videos and enjoy them on the beautiful 11.6” LCD, or on the big screen. Nativ Vita connects to your TV via HDMI or wirelessly with Google Cast. Holds a whopping 10TB of music. Store your music locally on Nativ Vita for maximum browsing performance, and to eliminate potential streaming issues with High-Resolution Audio. Nativ Vita supports two hard-disk drives (HDDs) or SSDs with up to 5TB each, for a total of 10TB. With two built-in HDDs Nativ Vita offers Raid 0 (to combine them to 1 single drive) or Raid 1 (for data safety). Or simply backup your music to an external USB HDD. Nativ Vita delivers you a wealth of information about your favorite artist, including biography, album details, tour dates and locations. Plus you can use the pre-installed Roon control interface to browse and play the music on your computer or NAS*. *Your PC/Mac must run Roon Lab’s music management (server) software. More details at www.roonlabs.com. Line up a few songs on the fly and see where the journey takes you. Enjoyed your walk down memory lane? Simply save the play queue with a touch of a button. Nativ Vita is a real prodigy when it comes to multi-room playback. It features the latest wireless technologies to stream music to other Nativ Vita, or to your existing wireless speakers. And a revolutionary touchscreen interface to control them all. Plays well with your speakers. Nativ Vita can stream music to virtually any wireless speaker, including WiFi, Bluetooth or Google Cast-enabled speakers. It is the perfect companion for your beautiful Bang & Olufsen Beoplay A9 or popular solutions like the Bose SoundTouch and SONOS. Simply place one Nativ Vita in each room and they connect and setup automatically. Play the same or different songs all over your home. Nativ Vita features the latest Bluetooth technology with aptX® so you can enjoy high-quality music on your wireless headphones and speakers. High-Resolution Audio (HRA) is gaining traction and many music services now offer an impressive collection of music in golden-master quality. Experience music in the same quality as it was originally recorded in the studio. Nativ Vita supports playback of DSD64, DSD128, DSD256, DXD and PCM signals up to 32bit/384KHz, including AIFF, WAV, FLAC, and ALAC audio file formats. We are also working on support for the new Master Quality Authenticated (MQA) technology. Sure you can use a PC. But why would you? Nativ Vita is exclusively designed for music and delivers music to your USB DAC or amplifier in bit-perfect quality. High-end digital output stage.Four high-quality digital outputs for SPDIF and AES/EBU, as well as an asynchronous USB 2.0 interface. Independent power + Electrical Noise Filter.Additional galvanic isolation and special in-line filter for the digital out section blocks all electrical noise from the hard disk drives. Pure 7000 series aluminum.Virtually eliminates unwanted EMI and RFI that can interfere with the sensitive audio signals. Fanless design.Sophisticated cooling concept to eliminate noisy fans. Meet the world's first High-Resolution Music Player that is based on an open platform. The powerful hard- and software is perfect for amazing 3rd party apps that extend its capabilities beyond pure audio applications. 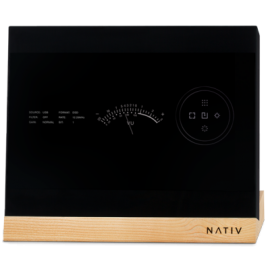 Nativ Vita's huge touchscreen interface and incredible connectivity make it ideal for integration into your smart home. The possibilities are endless. Nativ Vita’s contemporary design is a refreshing alternative to the many uninspiring consumer electronic boxes out there. We hand-built Nativ Vita in small production lots and only use exclusive materials, including premium-grade 7000 series aluminum with fine anodize finish, Japanese-made Asahi® glass and solid American wood. The elegant enclosure slides easily out of its wooden stand and can be placed on the wall with the beautiful wall-mount. Built-in support for Apple Music, Spotify, Pandora, Tidal etc. Shared libraries on PC/Mac/NAS via UPnP/DLNA or SMB/CIFS. aptX® support for high-quality streaming from your smartphone and to your Bluetooth headphones and speakers. Metadata: Support of multiple genre tags and .CUE files. MP3 (ID3v1 & ID3v2), AAC (M4A/M4P), OGG, FLAC, RIFF (for AVI/WAV files) and MP4 tags. Two hard disk drive bays that can install two 2.5” HDDs (SATA 3.0) with up to 5TB capacity each. Nativ Vita High-Resolution Music Player, Desk-stand (Oak), User Guide, IR Remote control, Power supply and cord. Converts 0s and 1s into beautiful sound. Nativ Wave is a fully balanced USB DAC and headphone amplifier that converts all your digital music into breathtaking sound. It incorporates state-of-the-art components and design methodologies that can only be found in the world's best audiophile DACs. The result is a wonderfully musical DAC with outstanding detail, precise stereo imaging and explosive dynamics. Fully balanced differential DAC design with two 24-bit/192kHz Burr-Brown DSD1792A. Sophisticated audio clock management system with two ultra-low phase noise oscillators by Crystek. Supports High-Resolution Audio such as DSD64, DSD128, DSD256, DXD and PCM up to 32-bit/384kHz. Meridian’s MQA technology delivers audio in studio master quality, in a file that is small and convenient to download or stream. Tidal and other services plan to stream in MQA. Powerful SHARC DSP and proprietary algorithms upsample to 128 Fs. Enjoy incredible purity in high frequencies and low-level detail. Customize sound with three finite impulse response filters: Linear/Minimum phase, Slow/Fast Roll-off and Standard/Apodizing attenuation. High-performance asynchronous USB 2.0 HS based on XMOS 16-Core DSP, plus inputs for SPDIF (RCA, TosLink, BNC) and AES/EBU (XLR). Analog output stage with 2 levels for low/high-gain amps, high-performance op-amps and top specs for THD+N, Dynamic Range & Channel Separation. Linear power supply with separate digital and analog supplies, 25 low-noise linear regulators, toroidal transformer and AC power line filter. Best-in-class headphone DAC & amp with high-speed buffer (2000 V/ms), incredible output power and single-ended and balanced outputs. Pure analog volume attenuator, fully balanced and bit-perfect. Absolutely no loss in resolution or dynamics. From MP3 to DSD. It’s all good. Although Nativ Wave is designed for High-Resolution Audio it significantly enhances the sound of all your music. Even compressed music from streaming services like Spotify and Pandora are filled with wonderful life and detail. Nativ Wave plays all major High-Resolution Audio formats including DSD up to 11.2896 MHz (Quad-DSD), DXD and PCM files sampled at up to 32-bit/384 kHz. Support for Meridian’s MQA is also in the works. Nativ Wave connects seamlessly to all your digital sources. Its cutting-edge asynchronous USB 2.0 interface with the latest 16-CORE DSP from XMOS is designed to perfectly process music from your Nativ Vita or PC/Mac. Additional audio sources like your TV can be connected via any of the four additional high-quality inputs for S/PDIF (RCA, TosLink, BNC) and AES/EBU (XLR). All digital inputs are carefully managed through our high-precision master clock generator and feature full electric and galvanic isolation to eliminate contamination and ensure signal integrity. Bit-Perfect or DSD Upsampling? Have it your way. Nativ Wave processes audio from the digital inputs in bit-perfect quality or upsampled to 128x Fs DSD. The DSD upsampling is handled by proprietary algorithms and a powerful SHARC DSP, which minimizes jitter and allows the implementation of a gentle analog filter with high slew rate and tight tolerances. The result is a noise floor that is well below that of the recording itself, and a fantastic linearity that reveals musical details you have never heard before. Nativ Wave features a Finite Impulse Response (FIR) digital filter so you can customize the sound to your personal preference for different music genres, formats and your stereo system. Settings of the filter are linear or minimum phase, slow or fast roll-off, standard or apodizing attenuation. Fully balanced differential DAC design. The heart of Nativ Wave is its state-of-the-art digital-to-analog conversion, which is based on a fully balanced differential dual-mono design featuring two 24-bit/192kHz Burr-Brown DSD1792A DACs. The result is an extremely low noise floor, phenomenal linearity and a great dynamic range of > 127 dB. On a board design level Nativ Wave perfect ensures signal integrity at all times, using pure copper tracings and keeping the signal path between the DAC and analog output as short as possible. All sound critical components are electrically and galvanically isolated, with additional shielding to reduce interference within the chassis to an absolute minimum. Left and right channel are entirely separated, each with its own dedicated linear power supply, state-of-the-art Crystal oscillators and analog circuitry. This maximizes channel separation and virtually eliminates crosstalk. Experience your music with a level of detail and dynamics that will make your hair stand on end. Nativ Wave employs a sophisticated audio clock management system that is based on two of the world’s best ultra-low phase noise oscillators from Crystek. The dual-clock design supports multiples of 44.1kHz (22.5792MHz) and 48kHz (24.5760MHz) independently, and uses best-in-class logic arrays for data reclocking to ensure that the signal to the DAC is absolutely accurate and cleaned of virtually all jitter and low phase noise. Nativ Wave automatically assesses the quality of all inputs, measures their frequency and jitter, and then routes the input to the best clock regeneration system. To maximize the acoustic performance all analog processing is done with high-performance operational amplifier modules from Texas Instruments. Additionally, German-made WIMA® FP Polypropylene Capacitors were chosen for their superior clarity and dynamic ability. Two output levels —2 and 7.5 Vrms— with a relay switching system allow connectivity to a wide range of low- or high-gain preamplifiers, power amplifiers as well as headphones. No servomechanisms or AC coupling capacitors are used to avoid sound degradation of any kind. Built for the best headphones. In addition to being a world-class Digital-to-Analog Converter Nativ Wave also incorporates a high-end balanced headphone amplifier, driven by the same cutting-edge dual-mono DAC design with two 24-bit/192kHz DSD1792A and using an advanced 100% solid-state topology. This remarkable headphone amplifier is not just a side product, but easily competes with the best standalone headphone amplifiers. Plenty of power. Our headphone amp delivers high output power (up to 1.75W) over various loads, enough to drive even the most demanding headphones. The advanced amplifier design uses a high-speed buffer with a slew rate above 2000 V/ms to prevent odd order distortion anomalies. The Achilles heel of many amplifiers is their volume control. It is most often digital for reasons of convenience, causing a loss of resolution and dynamics. Nativ Wave performs volume control purely in the analog domain and is completely bit-perfect, at any volume level. It features one stereo volume control chip per channel in differential mode, virtually eliminating noise and minimizing THD. Sounds amazing. Looks the part. The design of Nativ Wave is a refreshing alternative to the “synchronized” look of most USB DACs. We hand-built Nativ Wave in small production lots and only use exclusive materials, including premium-grade 7000 series aluminum with fine anodize finish, Japanese-made Asahi® glass and solid American wood. High-precision digital clocking system based on two ultra-low phase noise oscillators by Crystek and sophisticated data re-clocking. Nativ Wave USB Dual-Mono DAC, Desk-stand (Oak), User Guide, IR Remote control, Switching Power Supply. 1) Control via smartphone apps requires Nativ Vita. Independent, yet perfect partners. Our Nativ Vita High-Resolution Music Server and Nativ Wave USB DAC are impressive standalone solutions in their own right, and deliver best-in-class performanc..
Converts 0s and 1s into beautiful sound.Nativ Wave is a fully balanced USB DAC and headphone amplifier that converts all your digital music into breathtaking sound. It incorporates state-of-the-a..